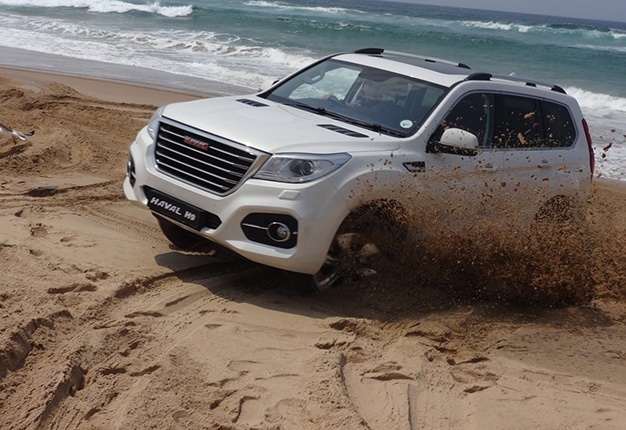 The recent Haval Outreach kicked off with six Haval vehicles travelling from Johannesburg to Cape Town along the East- and South Coast to showcase the commitment the brand has towards the local market. We joined them on the first leg of the journey. The Outreach convoy, consisting of two Haval H9s, two H6Cs, one H2, and a GWM Steed 5E as support vehicle, left Johannesburg late September to travel to Cape Town via the Kruger National Park, Sodwana Bay, Umhlanga, and Durban, the Wild Coast, East London, Port Elizabeth, and the Garden Route. According to Charles Zhao, Managing Director of Haval Motors South Africa, this journey is an opportunity for Haval, as a relatively new brand in the country, to "show its commitment to the local market by supporting various local organisations unique to South Africa." The first leg of the 4 000km-trip stretched from Johannesburg to the Kruger National Park with the aim of visiting the SanParks K9 unit, and for this section of the journey we were allocated a new H9 – the new flagship SUV of Haval, recently launched at the Festival of Motoring in Gauteng, and the first four-wheel drive model to be introduced locally. Now, if one had no preconceived ideas or conceptions, one would never have thought this petrol-driven, mid-sized SUV with seven seats is of Chinese origin. Its interior is detailed with soft-touch materials on the dashboard and door panels, and ten-way electric control buttons (on either side of the seat back) and soft leather for the front seats. Even at speed, the atmosphere in the interior stayed subdued, with only slight road and tyre noise penetrating the cabin. The vehicle felt solid and surefooted on the road, and the whole experience was comparable to that which you will find in an upmarket European or a top-end Japanese SUV. It comes with a five-year/100 000km, five-year/60 000km service plan/five-year/unlimited km roadside assistance. The large, comfortable seven-seater, powered by a 2.0-litre petrol engine with twin-scroll turbocharging, has 180kW of power and a maximum torque of 350Nm on tap, enough grunt for all types of driving conditions. Coupled to a super-slick ZF eight-speed 4WD automatic gearbox, the H9 was remarkably quiet and comfortable on tar. A choice of six on-road and off-road driving modes (Auto, 4-Low, Sports, Sand, Snow, and Mud), selected via a multi-functional display knob, is available. In Sport mode, the Electronic Stability Programme (ESP) reduces system interference, while in 4-Low, as well as Sand-, Snow- and Mud-mode, it amplifies torque delivery to the wheels with the best grip. It is also loaded with safety features, including airbags, seat belt pre-tensioners, Isofix child seat anchors, a tyre pressure monitoring system (TPMS), driver status detection system, and a full complement of driver aid systems. Even the third row of leather seats is electrically foldable, it has three-zone climate control and an advanced, yet easily manageable multi-media system with integrated satellite navigation. Other standard features on our 2.0 Petrol 4WD Luxury model (the only derivative now available) included automatic headlights with cornering light control, day-time running lights, a sunroof, shark-fin antenna, roof rails, side steps, and 18" alloy wheels. On the road, the big SUV astounded us with its solidity and steady manners. Sure, it is not all that agile and displays body roll in the corners, but on the sweeping Mpumalanga roads it still felt balanced and easily controllable – and on the beach at Sodwana Bay, aided by an electronic Limited Slip Differential on the rear axle, it really showed its 4×4 mettle. The steering, while quite accurate, felt slightly too light to my liking, an auto-disengage function for the electric handbrake would be a welcome addition, and lastly, we found that the small turbo engine became very thirsty when we were pushing on a bit. However, the H9 felt solidly built, and in terms of specification and price (only R599 900, with a five-year/100 000km warranty, a five-year/60 000km service plan, and a five-year/unlimited km roadside assistance included), it overshadows all competitors in the mid-size SUV class. The Kruger Park K9 unit provides training and logistical back-up to conservation areas and game parks through the deployment of a specialised working dog unit specifically trained to combat poaching across the country. According to chief trainer Johan de Beer, it constantly evolves to better fight the poaching crisis and uses clever tactics including the release of packs of highly trained tracker dogs to run on their own. This is normally done when poachers have already been spotted in the area, and free running dogs have a better chance of catching them without being slowed down by their human partners. The dogs are trained to detain and obstruct poachers from escaping until the rest of the team arrives. This level of training – and ensuring the animals receive the best possible care – requires regular funding, and Haval donated R10 000 to the K9 Conservation organisation. From Sodwana, we had the opportunity to sample the Haval H6C, mid-size luxury SUV powered by a 140kW-version of the two-litre engine. The H6C proved the best of the bunch in terms of trim and finish, with soft-touch materials throughout the cabin, and the auto-model, with a six-speed auto transmission, was ideal on the long road. At the Marine Surf Lifesaving Clubhouse in Durban, Haval made donations to two organisations: the Wylie House Child and Youth Care Centre and the Marine Surf Lifesaving Club. Both organisations received equipment and supplies as part of the Outreach Expedition. Wylie House has been in operation for 70 years as a haven for girls who have been abused or neglected, while Marine Surf is a well-known lifesaving club that offers young athletes the opportunity to compete in international lifesaving competitions. The next stop on the route was Coffee Bay in the Eastern Cape, the halfway mark of the journey, before the convoy headed for East London, and then for Cape Town down the N2 via the Garden Route.